While leading an investigation to determine if the new Secretary of State candidate (Henry Fonda) selected by the President of the United States (Franchot Tone) is qualified for the position, a young senator (Don Murray) finds his own life scrutinized. 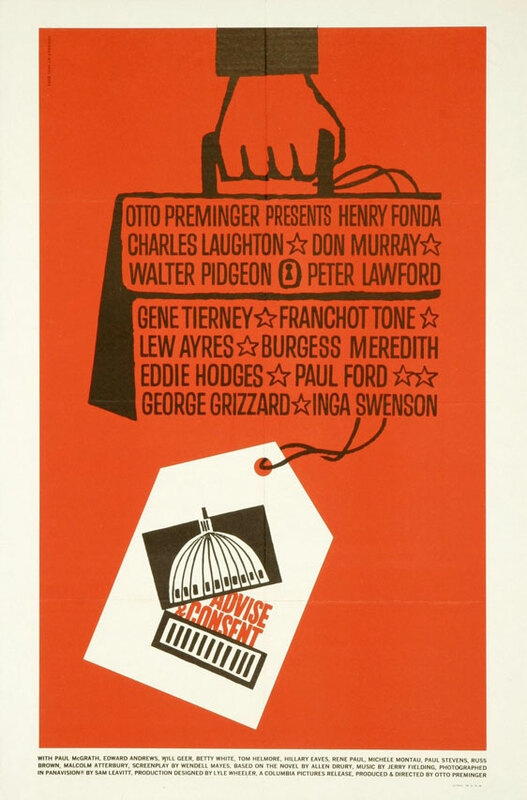 Based on the Pulitzer Prize-winning novel by Allen Drury, this fascinating, boldly themed film by director Otto Preminger never dumbs down its source material, instead providing attentive viewers with an unparalleled look at the inner workings of Washington, D.C. Unabashedly “political” (on more than one level), Advise & Consent exposes — and ultimately censures — the unbelievably treacherous nature of high-level politics, in which a person’s past actions and acquaintances, no matter how private, can come back to haunt him — and lobbying for one’s beliefs can cause irreparable (if unintended) harm to others. Other than the slowly gripping storyline itself (which takes its time getting to the crux of the drama), what’s perhaps most memorable about Advise & Consent are the documentary-like glimpses it affords of Washington, D.C. at work, complete with underground shuttles taking the senators to and from their sessions, and highly realistic interactions on the senate floor (with the senators referring to each other in third person). And, as Eric Henderson writes in his review of the film for Slant Magazine, “Preminger’s filmed version of the novel makes up for the various excised subplots and legal-procedural nitty-gritty with a typically unerring sense of spatial intrigue” — in other words, it’s surprisingly visually arresting for a “courtroom” drama. Meanwhile, the ensemble performances throughout are largely top-notch, and feature some unexpected surprises (i.e., a young Betty White in her film debut as an outspoken senator). Don Murray (whose notable earlier roles included ‘Bo’ in Bus Stop, and Johnny in Hatful of Rain) is perfectly cast, and entirely believable, in what turns out to be the film’s tragic central role — that of Senator Brigham Anderson, a “family man” with a conflicted history he’s determined to keep hidden at all costs. In his final role (playing Southern Senator “Seab” Cooley), Charles Laughton gives a typically nuanced yet showy performance; and Walter Pidgeon is solidly effective in a smaller role as the Senate House Majority Leader. P.S. If you haven’t seen the film or read the novel, be careful reading reviews online; almost all give away the central plot “twist”, which I’ve only hinted at here. Yes, as one of Preminger’s most powerful films. A must – one that holds up well on repeat viewings. I watch this one from time to time and it never fails to hold me in its grip. At the height of his directorial career, Preminger moved into his ‘big cast/big theme’ trademark, which obviously had hit-or-miss results. (He apparently bought the rights to ‘Hurry Sundown’ thinking he had another ‘Gone With the Wind’ on his hands; we know how that turned out.) I wonder if, more than a number of other directors at this time, Preminger was very much aware of the competition of that new invention ‘television’ and felt that one had to go one better to keep people coming to the movies. Or maybe – if we’re to believe the stories we still hear of how awful he could be on set – the root of Preminger’s modus operandi was a burgeoning ego, reflected in large projects. Or maybe it was a combo of both. 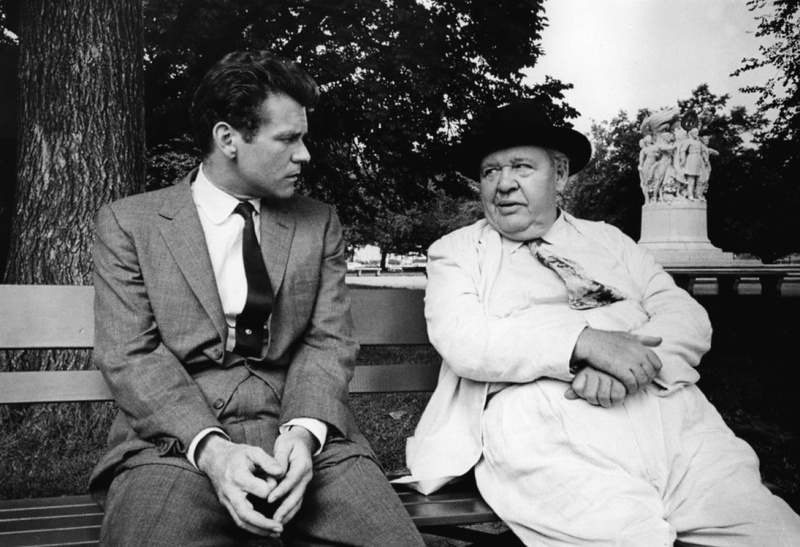 At any rate, it’s noticeable during the 1959-1967 period that, in Preminger’s films, male actors dominate. (Was that just easier for him?) For ‘A&C’, Preminger was fortunate in assembling a powerhouse cast of well-respected Hollywood men. All of them are at the top of their game here. And they no doubt knew that, regardless of who the director might be, the remarkable script was dripping with juicy steak roles for all of them. It might have just been foolish to say no to this kind of showcase material. If I don’t say much at all about the film itself, it’s because (for me) ‘A&C’ belongs to that ‘the less you know about it, the better’ group. Though I will say that the film is most shocking in delineating the difference between those in U.S. government (or on the periphery of it) who focus on what’s good for the nation and those who focus on what suits a much more personal agenda. Though the cast is uniformly excellent, I have to single out Fonda and Laughton. Because he’s not among my favorite actors, it always amazes me when Fonda makes me sit up and take notice, as he impressively does here. And Laughton…my goodness, what fearless, layered work in his final role! Preminger brought us a considerable number of efficiently made films that are effective as such. He made a fewer number of truly great films. This one is truly great!